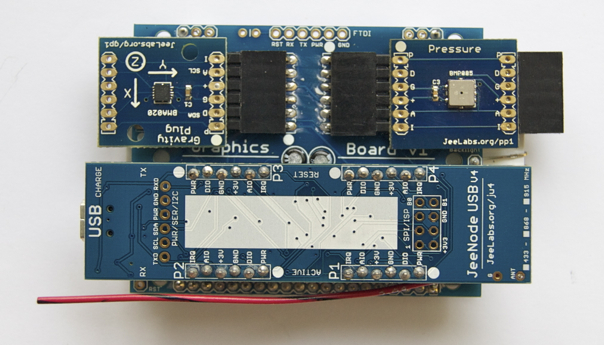 Both plugs use I2C, and could have been combined on one port. Note that the backlight is off in this example. 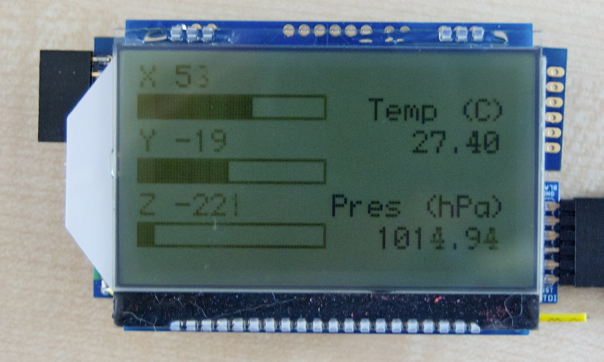 The GraphicsBoard class extends the GLCD_ST7565 class with print(…) calls and could be useful in general. 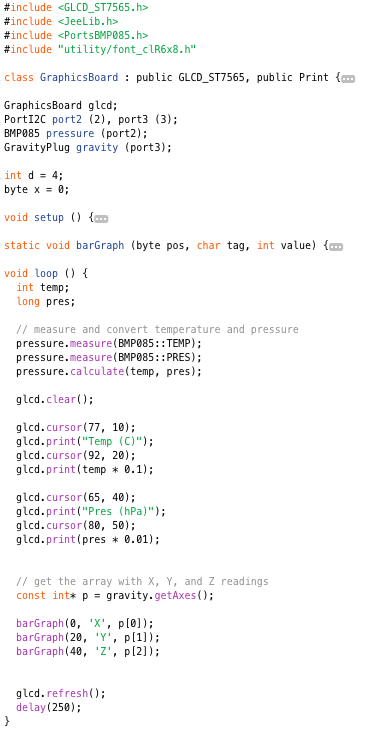 Get the GitHub version to see the details – omitted here for brevity. Unlike monospaced font tables, proportional fonts have character glyphs which all differ in size and relative positioning. This not only requires more storage, it also complicates the way these glyphs are stored in the bitmap image in flash memory. The width of a glyph can be found by looking at the position of the next character glyph in the bitmap, which is placed right next to it. I removed some parts for brevity. So the “!” exclamation point for example, has width 2 in the bitmap (i.e. 3-1), with pre- and post-gaps of both 1 (i.e. 5-4). And the “#” numbersign charcter uses kerning, with a -1 pre-gap. There is a problem, however. Most characters are fine, but after the “S”, the bit map position increments to a value greater than 255, which can’t be represented in a single byte! 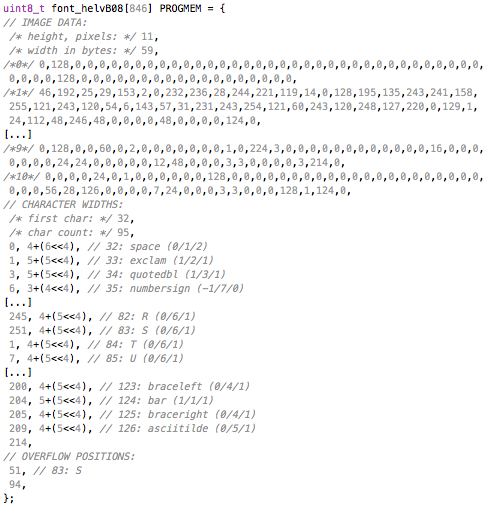 Instead of doubling the position to use 2 bytes each, I implemented an “overflow” mechanism. This saves some memory, since most positions are just fine, if we ignore the top byte. We merely need to keep track of those few character positions where overflow actually happens. 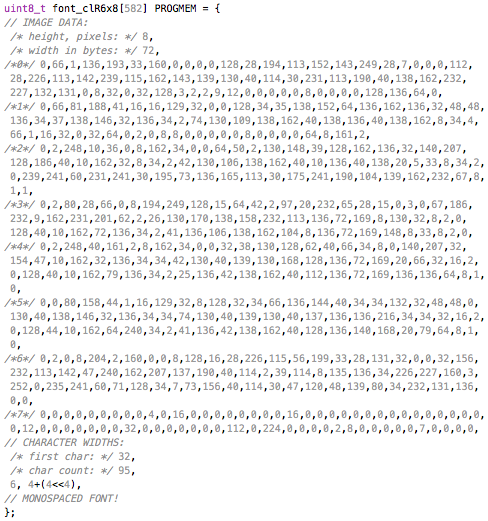 This is what the “overflow position table” at the end does: for each character which straddles a 256-pixel boundary, it stores the offset of that character in the table. The result is that there is now sufficient info to locate each glyph, and this process only requires a few flash memory reads for any character code. Note that for consistency, there are also two sentinels: one at the end of the per-character info, so that the width of that last character can be computed, and another one at the very end, to simplify the overflow calculation logic. 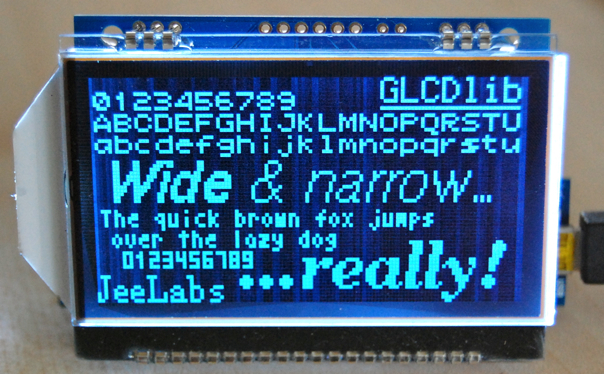 So there you have it: full font support, which easily fits in an ATmega! The font support added yesterday works with compact byte tables stored in flash ROM to store all the “glyphs”, i.e. pre-computed bitmaps. All the characters are stored side-by-side in a very wide horizontal bitmap image. In this case, the height is 8 pixels and the width = 72 x 8 = 572 pixels. The pre-gap defines where to start copying the glyph, relative to the current horizontal position. A negative value causes kerning. Likewise, the post-gap indicates where to start writing the next character. IOW, after a character has been processed, the horizontal position is advanced by P + B pixels (A does not participate in this calculation).